NEW MILFORD — Kristian Best carried pitchers of water from the kitchen at St. John’s Episcopal Church and placed them on a round table in the center of the room. Around her 16 tables covered in red-and-white-checkered tablecloths were friends and family speaking with one another at the Community Culinary School of Northwestern Connecticut’s first community dinner. Throughout the week, the school’s current class prepared the summertime meal of grilled chicken, berry cobbler and potato, vegetable and quinoa salad. She said the feedback from the guests was really positive and she’s enjoyed sharing what she’s learned in the program, including how to get the chicken so tender. She said it was a great way to showcase the program to the community. 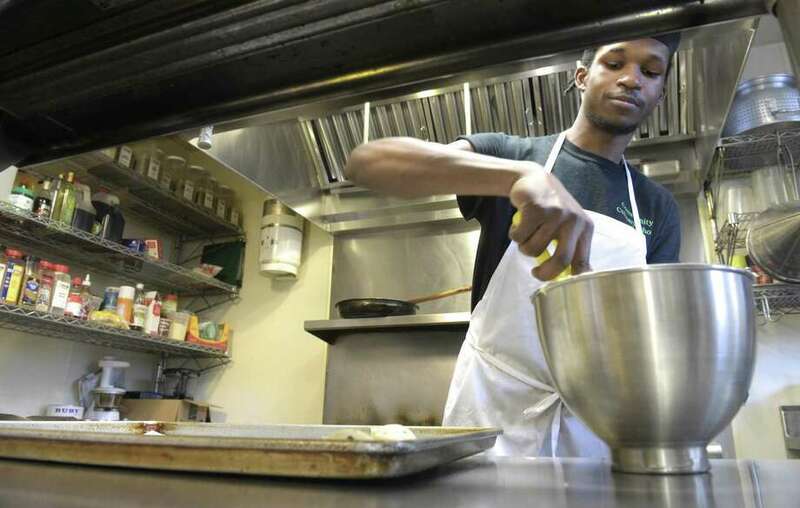 The school provides training to unemployed and underemployed adults to prepare them for a career in the food industry. “We really wanted to do something to support the New Milford community who has been so supportive of us,” said Dawn Hammacott, the culinary school executive director. Organizers hope the inaugural dinner will become a monthly event. Hammacott said the enthusiasm last week already convinced the school to do another event. About 125 people came out, exceeding the school’s expectations. Justin Elander, chef instructor, said school officials had wanted to do this event for about a year. They had originally planned to do it once the program moves to John Pettibone Community Center, but decided they didn’t want to wait any longer. “It’s great to get families out and phones down,” he said. They set the room up Thanksgiving style, to encourage people to meet and interact with people they might not know. That was why Michell Corwin and her three sons, Aiden, Guy and Garrett, decided to come to the dinner. Corwin moved back to New Milford about a year ago and saw last Thursday’s dinner as a way to reconnect with other residents. Her sons were quick to add the chicken and chocolate chip cookies were their favorite part of the night. Hammacott said these dinners give residents the chance to gather with their families and neighbors for a nice meal without having to do the dishes. “We really wanted it to be about the whole community, which is why we have the option to purchase through the community fund,” she said, adding about half the tickets were purchased this way. Tickets were $15 for adults and $7.50 for children, which generally covered the costs to make the meal. The event also provides valuable real-world experience for the students, who already prepare larger quantity meals for the food bank. “Preparing the dinner is the same thing, but it also gives them the opportunity to serve and see an event like this in action,” Hammacott said. Valerie Best, of Danbury, said she, her daughter and her mother-in-law, Yvonne Kiddoe, of Brookfield, came out to support her daughter, Kristian Best. “I always thought something like this was a good idea, but I never attended,” Valerie Best said, adding she plans to come again. Kiddoe said she appreciated the event.